50 years ago, Neil Armstrong became the first human to step on the moon. This would have never been possible without the vision and leadership of John F. Kennedy who helped start this project a decade earlier. As we celebrate and honor the achievements that made the moon landing possible 50 years ago, learn about the roots of this impressive human feat and the role that President Kennedy played in it through resources made available by the John F. Kennedy Presidential Library and Museum. President John F. Kennedy's Rice Univeristy Speech - "We Choose the Moon"
Historical essay on the space program during the Kennedy Administration. The free JFK Challenge app for iPad brings American history to life for kids by turning them into astronauts and Peace Corps volunteers. 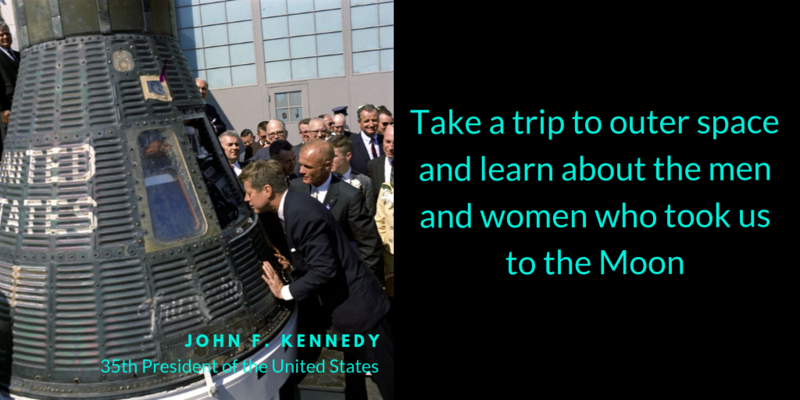 Fly to the moon or help people around the world with this exciting new offering from the JFK Library.